Everyone is going to want one! The state of New York employed prisoners to manufacture goods. 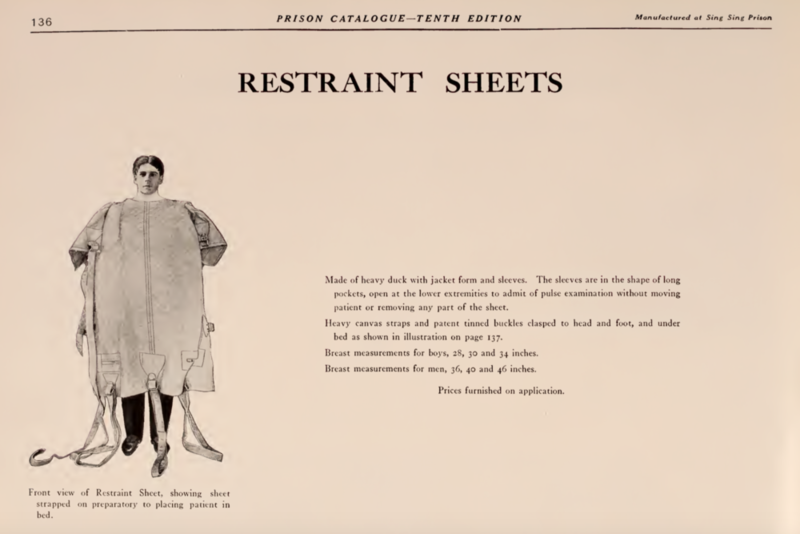 This prison restraint sheet is one of the prison-made items in their catalog for purchase in 1910. It's quite expensive at $10. They also have a drawing of the back of the restraint sheet and how it's worn in bed. Other items you could purchase from the prison system are sheets, men and women's undergarments, uniforms for nurses and doctors, children's rompers, hats, furniture- chairs, desks, wardrobes, chiffoniers, beds, baskets. It's almost a Sears catalog.